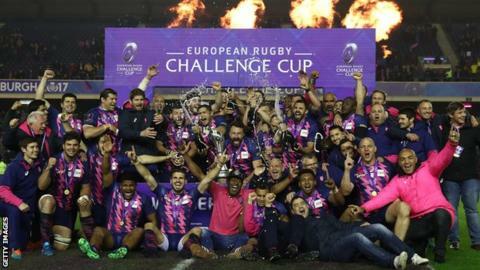 Edinburgh and London Irish will face holders Stade Francais in Pool 4 of the 2017-18 European Challenge Cup, after Thursday's draw in Switzerland. Back in European rugby following their promotion to the Premiership, Irish will also face Russian side Krasny Yar. Runners-up Gloucester will meet two French sides, Pau and Agen, plus Zebre. Cardiff Blues will meet Sale Sharks in Pool 3, while Newcastle Falcons will play Welsh region Newport Gwent Dragons and Worcester Warriors face Brive. Connacht join Brive and Worcester in Pool 5, which also includes French Top 14 team Oyonnax. In advance of the main draw, Gloucester were drawn as a top-seeded side, with Connacht missing out and joining the second seeds. Newcastle, Cardiff Blues, Stade Francais and Brive were the other first-ranked seeds. Teams will play each other twice in the pool stage, with the Pool winners and three best-placed runners-up qualifying for the quarter-finals. Pool 1: Newcastle Falcons, Newport Gwent Dragons, Bordeaux, Enisei-STM. Pool 2: Cardiff Blues, Sale Sharks, Lyon, Toulouse. Pool 3: Gloucester, Pau, Zebre, Agen. Pool 4: Stade Francais, Edinburgh, London Irish, Krasny Yar. Pool 5: Brive, Connacht, Worcester Warriors, Oyonnax.